As construction of Apple's Campus 2 headquarters in Cupertino continues, new aerial photos published Thursday show completed perimeter wall structures and below-grade levels ringing the footprint of the main structure. 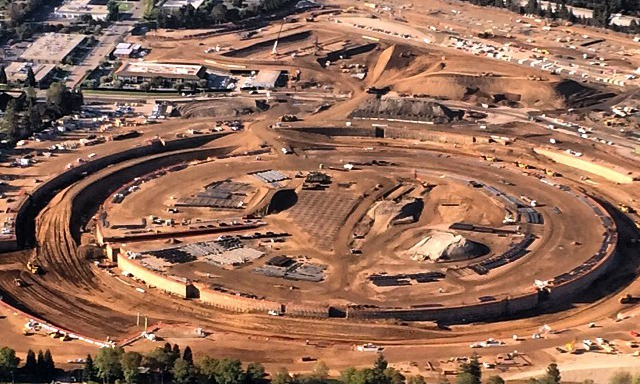 Two photos posted to Twitter and Instagram by KCBS traffic reporter Ron Cervi show dramatic progress being made at Apple's Campus 2 site, which only last month began to take shape. A little over one month following Cervi's first aerial pictures of Campus 2 construction, it appears that crews have carved out most of the basic substructure below the "spaceship" building and erected perimeter walls. As for the features Cervi calls "underground tunnels," the massive troughs are much larger than nearby heavy equipment and vehicles, suggesting the features will be used for below-grade floors. Plans for Apple's Campus 2 call for underground parking, though it looks as though construction teams have not yet made accommodations for the structure. Construction of Campus 2 has been ongoing since Apple won final approval for the project from the Cupertino City Council last November. Original plans for the sprawling campus were unveiled by late Apple cofounder Steve Jobs in 2011. Apple CEO Tim Cook said the company plans to move into the "spaceship" by 2016, but it is unclear if supporting buildings will be finished in that time period.